Social Security disability benefits are awarded to people who cannot work as a result of an injury (physical or mental) or a disease. The injury or the disease can be work related, non-work related or a combination of the two. Social Security disability benefits are paid to you monthly by the United States Social Security Administration. In general, anyone that has paid into the Social Security system can apply for benefits. If you have stopped working as a result of an injury or a disease you should consider filing a claim immediately. You can apply for Social Security disability benefits in one of three ways, on-line at the Social Security Administration's website, www.ssa.gov; over the phone at 1-800-772-1213; or in person at a local Social Security Administration office. If your application is denied, you are not alone. 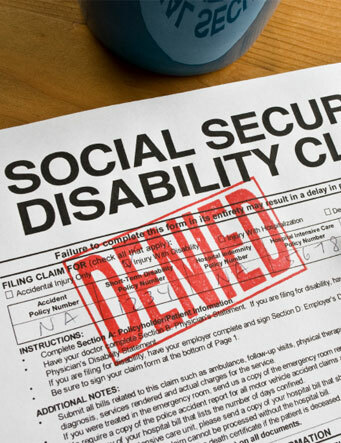 More than half of initial applications for Social Security disability benefits are denied. If your initial application is denied, get in contact with us right away (usually you only have 60 days to appeal the denial) and we will take your case to court on an appeal. Most people are denied Social Security disability benefits because they have failed to prove that they meet the definition of being disabled under the Social Security laws. Most often, the reason a person is denied is that they have not collected enough evidence to prove that they are disabled. We can help you collect the evidence that you need to prove that you are disabled. At the appeal, we will have you testify in order to fully explain to the judge how your medical problems are affecting your life and making it impossible for you to work.